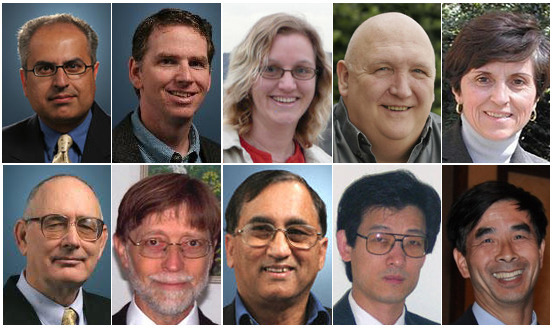 Top row, left to right: Bahman Anvari, Jay A. Farrell, Ann Heinson, Robert I. Krieger, and Manuela Martins-Green; bottom row, left to right: Thomas A. Miller, Allen Paine Mills, Jr., Aman Ullah, Albert Z.H. Wang, and Laosheng Wu. RIVERSIDE, Calif. – Ten researchers at the University of California, Riverside have been named fellows of the American Association for the Advancement of Science (AAAS). Including this year’s fellows, the total number of UCR faculty members who have been recognized with AAAS Fellow distinction is 190. Five UC Riverside alumni were honored this year. Besides Martins-Green ('75 M.S.) and Miller ('62 B.A., '67 Ph.D.), Jack D. Keene ('69 B.A.) and Ann Marie Pendergast ('86 Ph.D.) of Duke University Medical Center and Paul M. Hasegawa ('70 B.S., '72 M.S., '76 Ph.D.) of Purdue University were named AAAS Fellows. New fellows will be presented with an official certificate and a gold and blue (representing science and engineering, respectively) rosette pin on Feb. 19 during the annual meeting of the AAAS in Washington, D.C.
All the 2010 AAAS Fellows will be announced in the Jan. 28 issue of Science, a weekly magazine published by the AAAS. The AAAS is the world’s largest general scientific society. Founded in 1848, the association includes 262 affiliated societies and academies of science, serving 10 million individuals.